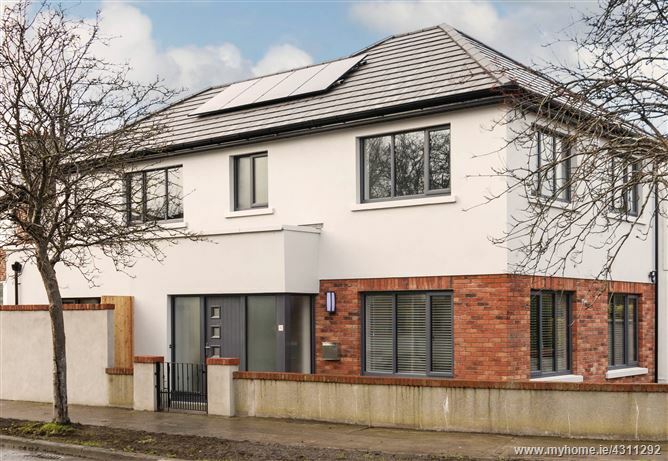 New to the February market, This is A rare opportunity to acquire a modern, detached A rated new build situated in such a mature, family friendly, tree lined cul de sac in the heart of Templeogue. Built to the absolute highest of standards this most impressive home boasts a number of special features including a hand painted “in frame” bespoke kitchen, quartz worktops, a large full fitted utility room, a highly efficient GFCH system, a heat recovery ventilation system and solar panels to name just a few. Being a new build, the property is highly energy efficient resulting in lower energy bills. The property itself is deceptively spacious, boasts a luxurious interior and a sunny south west facing landscaped rear garden. The attention to detail is clearly evident from the moment one enters this fine home, once inside you are greeted by an airy light-filled entrance hall and storage space. The open plan kitchen/dining/living space spans the width of the house to the rear and overlooks the suntrap garden, an ideal layout for modern living and boasts a high-quality finish. To the front sits a comfortable and luxurious living room, also on the ground floor level is a large utility room and guest w.c. On the first floor there are 2 spacious double bedrooms and a spacious single room. The master bedroom boasts a well-appointed en suite and a fully fitted walk in wardrobe. The main family bathroom is also on this level. Located just a 5 minute stroll of Templeogue village and all its amenities. This is an ideal location for those seeking quick and easy access to each side of the city as it is within minutes of the M50. Terenure village and Bushy Park are also close by. Also, within easy reach are an excellent choice of schools including Templeogue College, St Pius and Terenure College. The city centre itself is only 7km away from the property. Dublin Bus operates the following bus routes through Templeogue: 15B, 15D, 49N, 54A, 65, and 65B. Sporting facilities are well catered for with Faughs GAA Club, St. Judes GAA Club, St. Mary's College RFC, Templeogue Swimming Club, Templeogue Tennis Club, and Templeogue United Football Club all within walking distance. Painted Solid Core Shaker-style internal doors with high quality Stainless Steel contemporary ironmongery. Features a contemporary timber stair with oak hardwood handrail. Harwood engineered Timber floors to ground floor rooms. Tiling to hall, utility & WC. Fully carpeted bedrooms, stairs and landing. Energy efficient A-rated Gas Fired Central Heating system. Fully wired for and fitted with Aztec Security systems. TV and internet points in kitchen/dining, living rooms and master bedroom. A high-efficiency - Vent AXIA Kinetic Plus Heat Recovery Ventilation (MHRV) system fitted as standard. Trina Solar Photo Voltaic (PV) Panels fitted to generate electricity to supplement the mains power to the dwelling. A truly unique stylish contemporary light filled interior finished to exacting standards awaits the discerning purchaser of this exceptional detached state of the art modern residence. No 1A is constructed to provide a high level of insulation and energy efficiency. Secluded suntrap private garden to rear – with Granite Paved Patio & grass garden enclosed by block walls, rendered & capped. Double-glazed uPVC Windows secured with reinforced fittings including three point locking & safety catches. Contemporary high-performance front door with multipoint locking system. Contemporary streamlined style kitchen, with quarts stone worktop. Modern Siemens appliances include an integrated larder fridge freezer, single oven, combi microwave oven, large induction hob, extractor and integrated dishwasher. with ample storage units complete with sink, Bosch washing Machine & Bosch Tumble Dryer. Access to additional storage under stairs. *Every square foot of the home has been carefully considered to ensure it is a truly unique and quite special family home. *High quality external façade finished with a combination of brickwork, blockwork with painted render complete with *granite sills. *Covered by a 10-year Homebond Structural Guarantee.